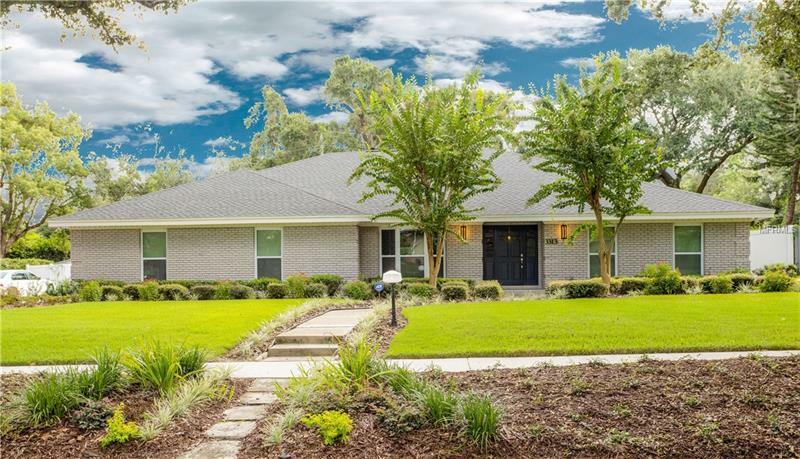 Prepare to be impressed by this beautifully renovated home in prestigious Southern Oaks. No detail has been overlooked in this 4 master bedroom, custom home: spacious foyer, formal dining and living rooms, large, light-filled bedrooms, 4 fully renovated bathrooms and a gourmet kitchen with stainless steel appliances, clean, modern cabinets and custom, quartz countertops. An ideal split floor plan offers a private wing on the north side of the home with an expansive master bedroom and spa inspired master bath. The open floor plan is entertaining/family friendly with an open, modern kitchen and family room with wood burning fireplace. French doors lead to a fully enclosed 15 x 45 foot screened in porch overlooking the 9.5 ft deep, oversized pool. The property features new white vinyl fencing for optimal privacy, new lush landscaping/sod and new efficient sprinkler system. All the updates are complete! Renovations include new paint, new hardwood flooring and tile throughout, upgraded double insulated vinyl windows throughout, 2 new (3) ton AC systems, new duct work, 2 new water heaters, new plumbing and water softener and expanded 3-car driveway. 2-car garage features separate workshop and new garage door. This home is one-of-a kind; it's exquisite in its attention to detail and design...stunning and move-in ready! Call today for a private viewing.